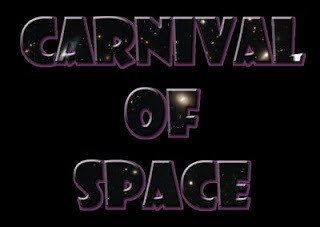 This week's Carnival of Space (the 102nd edition) is hosted by one of my favorite astronomy bloggers Carolyn Collins Petersen at The Spacewriter's Ramblings blog. This edition has been divided into chapters, or acts. 1- Solar System, 2- Stellar Follies, 3- A Brief Galaxy Diversion, 4- Future Humans, Exploring the Universe, and Examining Cosmic Mysteries and 5- Education, Amateur outreach and Politics.